I’ve been watching our newest neighbors as they take up residence in our yard. 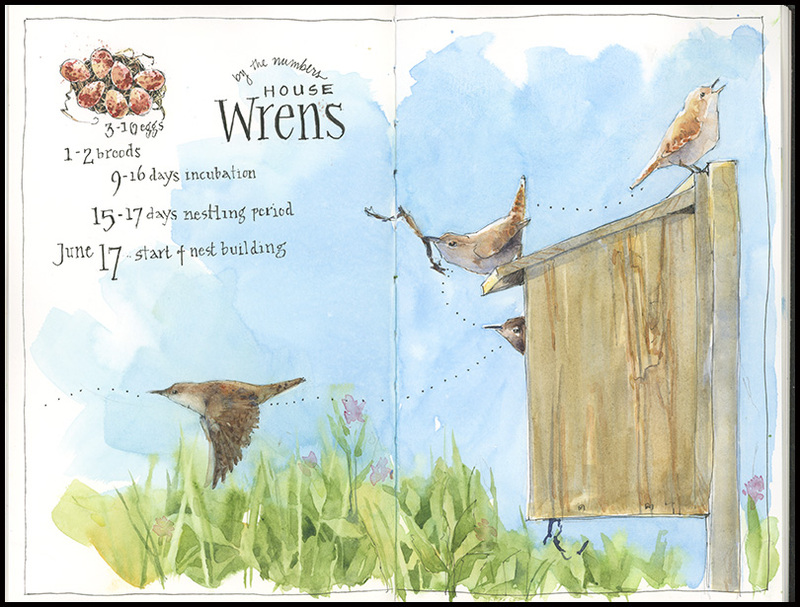 Bluebirds recently fledged from one of our nest boxes and a brief battle for the box was won by a pair of house wrens. There are not really four birds, as depicted, but I wanted to capture the pattern of the pair’s activities during the nest building stage. These poses were repeated over and over as I sketched. You’d think that would have made it easier, but wrens aren’t known for standing still. I switched between using binoculars and picking up the pencil to make the initial drawing, then added color later. I like the way the poses capture the some of the story of the wrens setting up house. 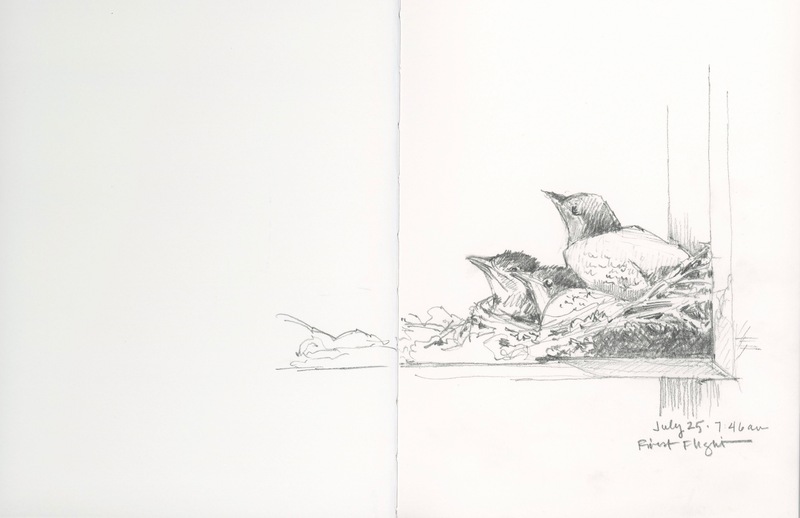 Tips and Techniques– I used a pale non-photo-blue pencil to make my initial sketches of the wrens. This gave me a chance to work on the postures before committing to ink. A regular pencil would have been fine, too, but the blue pencil is easy to erase and cover over with paint. It’s a handy tool for birds and other tricky subjects. For the last month, I’ve been watching a robin’s nest that sits on the sill of an eyebrow window at our house. I’ve been able to directly observe everything from four perfect eggs to four pathetic-looking naked chicks to four gaping mouths, begging for their parents to stuff them full of moths and worms. Last Sunday I made this ink sketch, added a bit of color on Monday night, and figured I finish the page later this week. But even when you count your chicks before and after they hatch, it doesn’t mean things will turn out well. I expected to see four jostling chicks with feathers today and instead found a perfectly empty nest. I checked the calendar, checked my nest records, checked reference books, and checked again. Eleven days…just shy of the 14 to 16 days that it typically takes for nestling robins to fledge. My suspicion is that an owl made off with a nice meal. Although the birds were protected from ground predators, they were otherwise completely exposed, especially as they grew larger and began to overflow the bounds of the nest. It’s an unfortunate fate…unless, of course, you take the owl’s perspective. Tips: If you are observing nesting birds, it’s a good idea to follow a birding code of conduct to make sure you don’t disturb the birds. The Cornell Lab of Ornithology NestWatch program is a good place to learn and to contribute your findings. Finding bird nests is something typically reserved for late autumn, when fallen leaves reveal summer’s hidden treasures. But I’ve been lucky this spring. Bluebirds and trees swallows took up residence in nest boxes we put up in April; a robin returned to a nest used last year on an upstairs window ledge; I spied a pair of cardinals making their nest in a hemlock bough; and, just last week, I caught sight of an American redstart as it landed and disappeared into a tangle of shrubbery at the edge of the woods– a tell that led me to discover its well concealed nest. I know there is a lot more nesting going on in the surrounding woods and field, but it may be autumn before I am able to add more to the map. Tips and Techniques– I love making maps and find that it is an excellent way to learn and record information. I made this one so I would have a reference for future years’ nesting activity on our property. I used Google Maps to sketch the aerial view– it’s a great tool for getting the basics of the landscape geography you want to record. 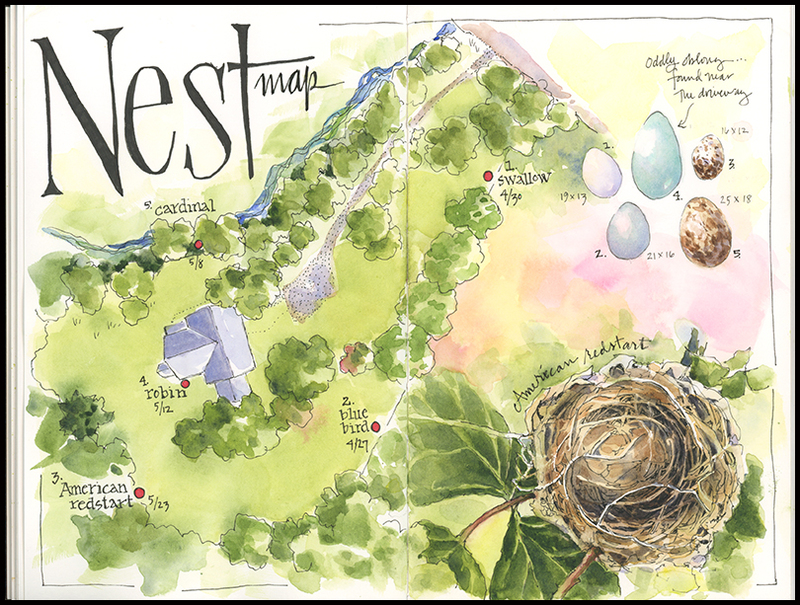 Once I had the map laid out, I added the nest, using a photo of the actual nest so as not to disturb the birds. I had been hoping an egg or two would have already been laid, but because I was a bit too early, I decided to add the eggs for each bird as a separate element. 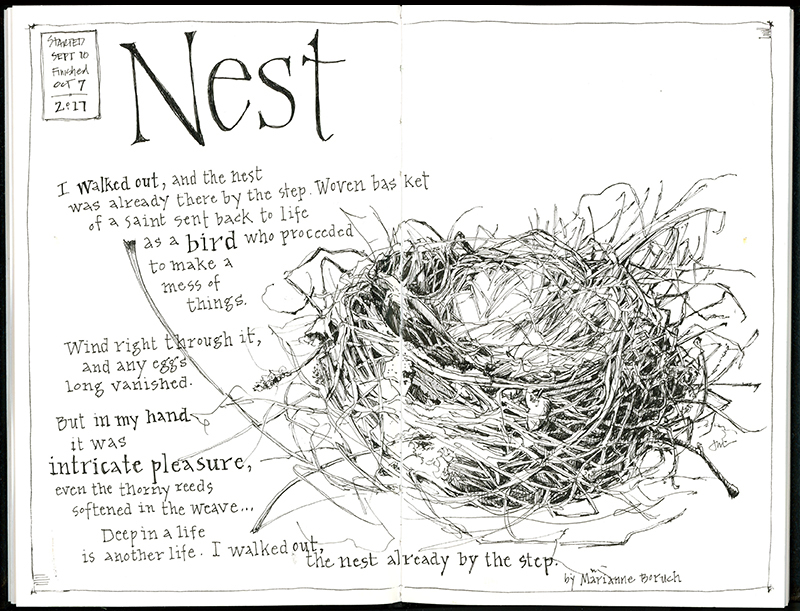 I used the Princeton Field Guide Nest, Eggs, and Nestlings of North American Birds by Paul Baicich and Colin Harrison as a reference, as well as an atypically oblong robin’s egg found abandoned near our driveway. I get up early to make the 1.5 hour drive to the small town of Granville, New York, not far from Vermont’s Green Mountains. Arriving just before 10am gives me just enough time to buy a coffee before the doors open at one of my favorite places to sketch: the Pember Museum of Natural History. I make this pilgrimage once a year and I’ve already decided where I’ll spend the next four hours: hovering over the glass and cherry cases of Victorian-era bird nests and eggs. The selection is fantastic: eggs of every size and pattern, from tiny cream-colored hummingbird eggs to the huge streaked egg of the extinct great auk, and rows of woven nests decorated with leaves, lichen, and moss. I’ve drawn a good number of them over the years, so I choose ones I’ve passed over previously, put pen to paper, and begin. Hours later at closing time, it’s just me and the lone curator left in the museum and I’m satisfied…though I already look forward to my return next year. 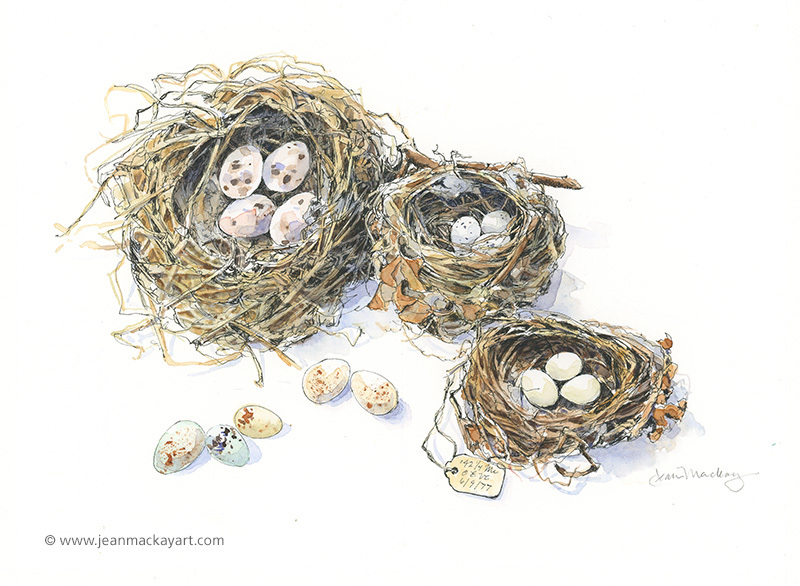 I sketched this trio of nests in detail using a Micron pen on Fabriano hot press watercolor paper and painted them later at home. 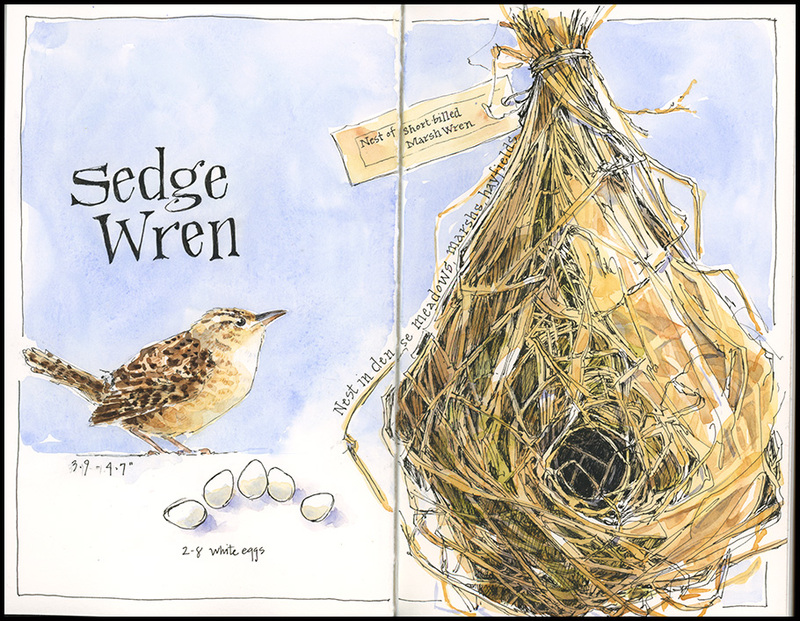 I did a fourth in my journal— the nest of the sedge wren, posted last week. Tips and Techniques: When drawing a nest, spend a few minutes really looking at how it’s made before beginning. There are often interesting bits of materials that you’ll want to highlight. Usually the weave gets tighter in the inner cup, which may also be lined with downy material or feathers. Consider that the bird has already created the masterpiece. Your job is to translate it onto paper. Keep your lines very loose as you start, following the weave of twigs, grasses, or pine needles around the cup-like shape. Once the basic structure and strands of material are roughed in, I typically use negative painting (or drawing) techniques to weave darker shapes and strands underneath lighter ones to develop the complex weave. Pay attention to values! Getting darks and shadows in place will really make your nest take shape. I will be ordering prints of this painting for sale for $30 (includes mailing). If you would like to order a copy, please e-mail me at jeanmackay.art@gmail.com. Prints are made on archival quality Hahnemuhle Museum Etching paper, 8”x10” and suitable for easy matting and framing. I found this nest in the collection of the Pember Museum of Natural History in Granville, NY, where I spent the better part of a day sketching nests that have outlived their builders by more than a century. Somewhere in the weave of stems lies the faint echoes of a grassy wetland, the calls of birds and frogs, the mix of cool air and warm sunshine, of another springtime. I’ve never seen a sedge wren (also called the short-billed marsh wren), and this is as close as I may come. Can you imagine how such a small bird weaves a ball of a nest with nothing more than a beak? Tips & Techniques– Include field notes in your journal to make it a good reference for what you discover and learn. When I first saw the label on this nest I didn’t know that there were two distinct marsh wren species: a short-billed and a long-billed. I had seen marsh wren nests that didn’t look quite like this, and a quick Google search explained why—the ones I’d seen were made by the long-billed marsh wren. These two species have different colored eggs, too: white versus mottled purplish brown. Art, discovery, and learning fit together beautifully for me in the pages of my journal. I hope you have opportunities to do the same! I walked out and found the nest in the gravel driveway, not by the step as the poem says, but close enough. Poem copyright © 1996 by Marianne Boruch, whose most recent book of poetry is “Poems: New and Selected,” Oberlin College Press, 2004. I’ve been watching this robin’s nest on the window ledge of our new house for the last 10 days and every day I’ve wanted to sketch it. I’ve seen the tiny hatchlings go from half naked and barely opening their eyes to spouting feathers to jockeying each other for position in an overcrowded nest. Still, day after day, more pressing chores related to moving here kept me from picking up a pencil. Then this morning, I decided to get off a quick sketch before going to work, lest I miss the chance. I spent about 15 minutes on this, during which time the bird on the right stood up, stretched its wings, and made a flying leap! What a sight! And what a perfect subject for the start of a new journal and the beginning of a new chapter of my life in a new (very old) house in New York State. 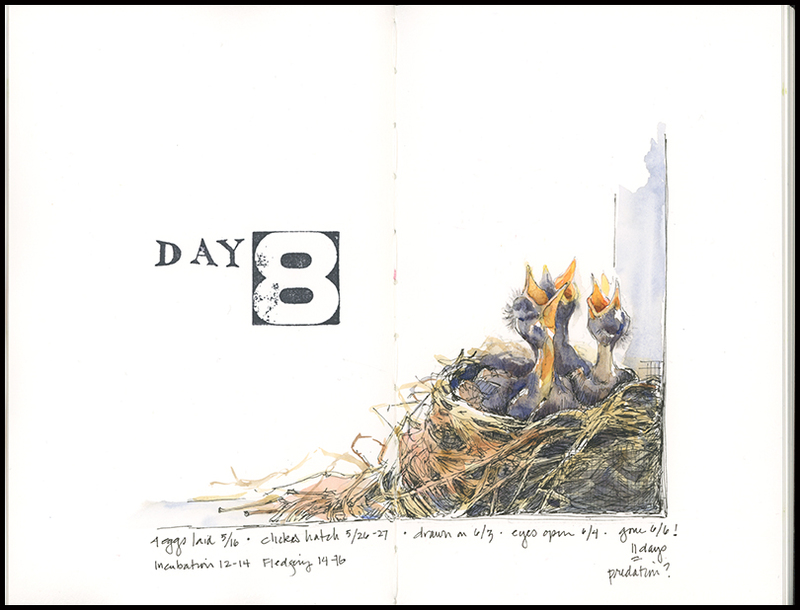 Note: I did have a chance to paint newly hatched birds in this same nest in early June. Robins often raise two broods a year and the birds in today’s sketch are from the second brood. Robins incubate their eggs for 12-14 days and the young take about two weeks to fledge. Both males and females care for the young, feeding them worms, moths, and an assortment of other insects.